3jc Ltd Warehouse & Workplace Solutions. Unit 113 Condover Industrial Estate. 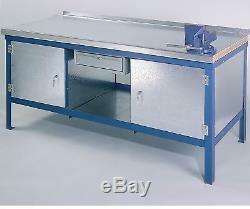 Extra Heavy Duty British Manufactured Work Benches With Wood & Steel Top. Please note: The picture shows bench with extra cupboard, draw and vice which are all available extras. Constructed from steel angle with lower galvanised steel shelf. 45mm thick wood covered with galvanised steel work top reinforced with steel bracing underneath and lip at rear. Lockable cupboard on left hand side, steel vice plate welded underneath top on right hand side ready for vice mounting. (This configuration can be changed around on request). Cupboard measures 600mm x 600mm x depth of bench. Available in a choice of 12 sizes. 1200mm wide x 600mm, 750mm or 900mm depth. 1500mm wide x 600mm, 750mm or 900mm depth. 1800mm wide x 600mm, 750mm or 900mm depth. 2000mm wide x 600mm, 750mm or 900mm depth. All benches are 840mm tall. (Other heights available at no extra cost, please ask). Cheques (payable to 3jc Ltd). Any questions will be answered as soon as possible. All measurements are given to the best of our ability. Failure to do this may result in storage charges being applied. Goods for sale can be viewed any time during the stated office hours. Please always ensure you provide your postcode. Larger items are usually delivered by carrier. Please have goods sent to an address where someone is available to sign for goods during office hours. Goods can be collected from our Warehouse near Shrewsbury, Shropshire Monday to Friday 8.30am to 5.30pm. We can also pack your goods for collection by your carrier / transport - We have full loading facilities on site. The item "NEW Extra Heavy Duty Wood & Steel Top Workbench Cupboard & Shelf Size Choices" is in sale since Sunday, June 12, 2016. This item is in the category "Business, Office & Industrial\Other Business & Industrial". The seller is "3jcsales" and is located in Shrewsbury. This item can be shipped to United Kingdom.